For the past 23 years, our farm dogs have been Labrador Retrievers. First was Spike, a black lab, who was such a hit with our Christmas tree customers that many said they actually came back year after year to visit Spike and the Christmas tree was a bonus. After Spike, Buddy, our chocolate lab, came into our life. In his early years he was everyone’s dog, riding in the trucks, supervising the work in the shop, lounging on the apron of the shop at the first hint of spring, and nudging hands onto his head for ear rubs. As he got older he preferred the shade of the porch or, even better, the air conditioning vent in the summer. After 13 ½ years, we had to say goodbye to him. A year later, we were missing that special companionship that a dog provides. Our life changed when we brought home a squirmy little puppy in December. Nellie when she first came home….she’s much larger now! Little Nellie is beautiful bundle of energy. She is a yellow lab, a visual reminder that she will have her own distinctive personality, separate from Spike and Buddy. It has been over 14 years since we last dealt with a puppy. We are once again surprised at her razor sharp baby teeth, her curious nature, and the amount of time and energy it takes to raise a puppy. Nellie has been with us for a little over two months now. At this point, her favorite activity is counter surfing. Sometimes I wonder if she is asking, “What is this word ‘off’ and why do you like it so much?” In many ways, she is much like an overtired, obstinate two year old with a huge reserve of persistence. We work to keep her occupied with training, chew toys, and frequent naps. Despite the change in our carefree lifestyle, Nellie has wormed her way into our hearts. When she’s tired, her favorite place to sleep is with her head on our feet. We’re not sure if this is a lab thing, or if she is channeling Buddy. We like to think he is giving her tips on how to be the perfect puppy for his ‘people.’ I just wish he’d tell her to stop chewing my slippers, and jumping up! Tara Lazar has done it again! Formerly known as PiBoIdMo held in November, Storystorm https://taralazar.com/category/storystorm-2017/ has moved to January. I love starting the year like this. January has always felt like a new beginning, a chance to finally get the things done I have been putting off. What have I been putting off? Writing! The past few months have been extremely slow writing months, but packed full of life. I have spent a lot of time with my grandchildren, gotten a new puppy, and enjoyed the holidays with family. All of these experiences are fueling my Storystorm notebook of ideas. I spent a week with my granddaughters while their parents were on a business trip. Watching a 15 month old literally race around the house and truly enjoy life reminded me of the joys of the small things in life. We hosted an early Christmas full of aunts, uncles, grandchildren, and dogs. A house full of kids 10 and under is a treasure box of story ideas. A puppy in the house has brought much laughter, plus story ideas by the dozens. My granddaughter and I made rolls for Christmas dinner, her first attempt at making her favorite part of the meal. Her mother treated us to Christmas Eve afternoon at the Nutcracker Ballet. We made spritz cookies, another favorite due to the use of a battery operated press. All of these activities were family bonding at its best. Now my job is to jot down the ideas as they bubble up in my brain. As has happened in the past, I itch to play with these ideas and convert them into stories. Writing has moved up the priority list as I make time to write. So once again, thank you Tara Lazar for the motivation to record 30 story ideas in a month, and for all of the inspirational posts you and the wonderful guest bloggers have provided. I am rejuvenated and ready to write! I woke this week to the promise of spring. Despite the frost on the grass, it looked like spring. With blue skies, sun warming my office it also feels like spring. 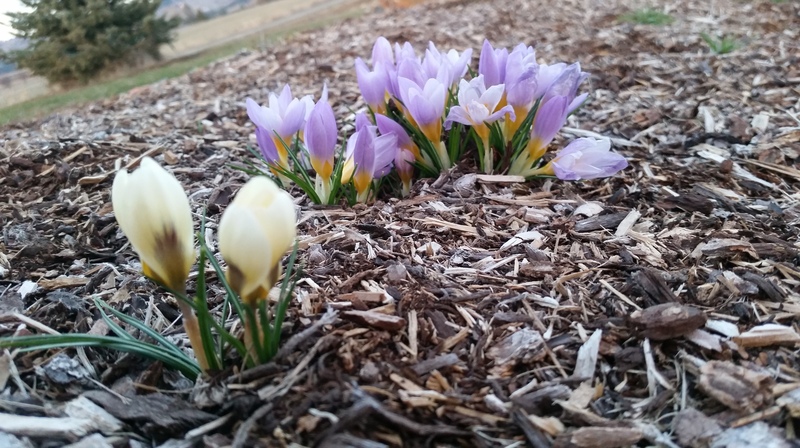 My yard is also buying into this vision of spring with crocuses popping through in my flower beds and some anxious perennials putting up tender green sprouts. I’d like to tell them to wait; Mother Nature is just playing with you. The forecast for next week is possible snow! My wiser perennials are still tucked safely in the ground waiting for the real spring to arrive. Since it is still February, I know this is simply a spring tease, something Mother Nature likes to do to remind farmers that spring work is not far behind. If this beautiful weather lasts a week or so, farmers will be gazing longingly at their fields. Some may take the bait and try to work ground. They will most likely regret it, especially if they are in a tractor that is mired in mud. The time that it will take to wait for the ground to settle up and dry enough to release the tractor will be excruciating. If the tractor is near the road where everyone can see it, it’s even worse. Having your misery announces to the world is never fun. The tractors, cultivator, drill, and sprayer have all been serviced and adjusted, ready for work. They sit in the sheds and grass longing to head out and get some real work done. But, like the farmer, they need to wait. Timing is critical to crops, and sometimes waiting for the right time isn’t easy, but it will always pay off. So, to my farmer and all those others who see the potential of spring. Wait… wait until the time is right. Your loved ones don’t want to deal with a cranky farmer whose tractor is held prisoner by a field. One morning last week, when I went down to my office to write, fog had closed in around my back yard obscuring all that was beyond. It was early. The basement was quiet, no one on the treadmill yet, no TV to interrupt my thoughts. The shroud of fog added to the atmosphere of stillness and quiet. During that quiet time, this poem flowed into my mind. Fog wraps me in a cocoon of silence. The world disappears creating my own little island. Life’s distractions fade by the wayside. My mind clears, relaxes, calm thoughts float by. Morning is quiet as the fog gently lifts. My day unfolds slowly making time for reflection. I welcome the peace as I begin my day. Part of me wishes I had thought to capture the view on my phone or camera, but I doubt it would have captured the picture that remains in my mind. Sometimes there are moments in life that stay with us. They appear in our memory returning us to the emotion it created. When I need to escape the hectic pace of life, I will remember the peace I felt when the fog wrapped me in its gentle arms. In September, I had the opportunity to attend the Northwest Inland SCBWI conference in Spokane. The best part about SCBWI conferences is the one-on-one critiques with the conference keynote speakers. To some this is a scary proposition. No one likes to hear that the story they have labored over still needs more work. BUT…this is exactly what most unpublished authors need to hear. I have seen attendees come away from critiques crushed. This usually happens when they go in thinking that the agent, editor, or author will fall head over heels in love with their work, offer them a contract on the spot and they will be set for life! Sorry folks, that’s a dream. It’s a dream that many of us share; however, we’ve learned that it is just a dream and it rarely (if ever!) happens like that. So, what does happen? SCBWI critique sessions are both encouraging and instructive. The key to making this a positive learning experience is to keep an open mind and realize that taking risks is a necessary part of all learning. This year, I was lucky enough to nab a session with author/illustrator Jennifer K. Mann. Just a few weeks after the conference, her picture book, Two Speckled Eggs, was named winner of the 2015 Washington Scandiuzzi Children’s Book Award. This lady knows what she’s talking about! Check out her website at jenniferkmann.com. Her presentation about analyzing picture books visually was full of information I’m using to study picture book structure. For most of us, it takes a few minutes or days for the full impact of a critique session to sink in. Then we are able to relish the positive aspects of the story that were pointed out right in the beginning, and honestly evaluate the places in the story that need more work. I was challenged to look at the plot structure. So, the next week I checked out a number of picture books and looked at them with structure in mind. I’m using Jennifer Mann’s techniques to analyze them which make it much easier to see how the type of revisions she suggested would make my story much stronger. Critique groups are great, and I learn a lot from mine (see our picture below), but conference critiques give you the opportunity to see your work through the eyes of a professional. So…be brave! Sign up for a critique session at your next conference. My critique group clowning around at the Inland Northwest SCBWI Regional Conference. It’s probably obvious that the conference had a circus theme! I won’t kid you. It always hurts when the dreaded rejection letter drops into your mailbox or inbox. The first feeling is one of a letdown, especially if the manuscript was at the editor or agents for many months. During those months, as much as we try to prepare ourselves for the worst, visions of contracts populate those minutes before we fall asleep. Let’s face it, we are writers. Our imaginations are often on overdrive. When reality hits, it might take a few hours or days to recover. For me, it only took a few hours this time. I looked at my manuscript and thought, they are right. It might be a better fit somewhere else. I’m not sure where that place is yet, but this has taken me out of the waiting game and back into an active pursuit of manuscript placement. I’m doing more research, making lists of places to send it, and checking to see if there are any more revisions that are needed before sending it off again. It has also renewed my commitment to my writing. I have read plenty of posts from successful writers, agents, and editors who all say those who persist will be successful. The more we write, the more we improve. I’ll continue to work on my craft in order to produce the best manuscripts possible and then send them off and see where it takes me. Here’s to forging on. Harvesting wheat on the Homeplace. Today was the last day of an unusual harvest. We have never been completely done with harvest by August 21. Most years we start our 5-6 week harvest around August 10th. This year we began harvesting winter peas on July 23rd. Despite the early start and just four weeks of harvest, it seemed to drag on this year. According to the calendar, we are nowhere near time to finish harvest. Somehow, the fact that we were rolling through the fields didn’t register in our brains. It still felt like we should have a long way to go before we finished. 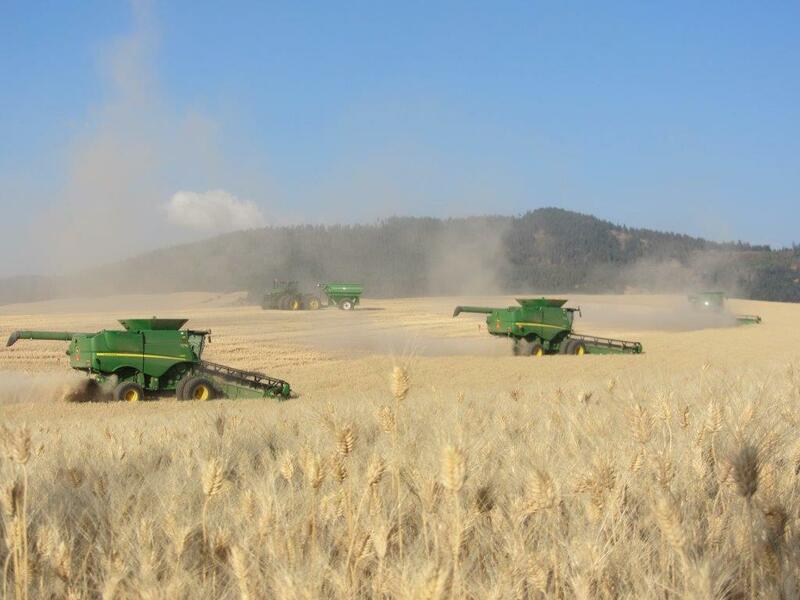 All of our combines working together during wheat harvest. The exceptionally hot June and July with little to no rain meant our spring crops didn’t have the moisture they needed to produce average yields. 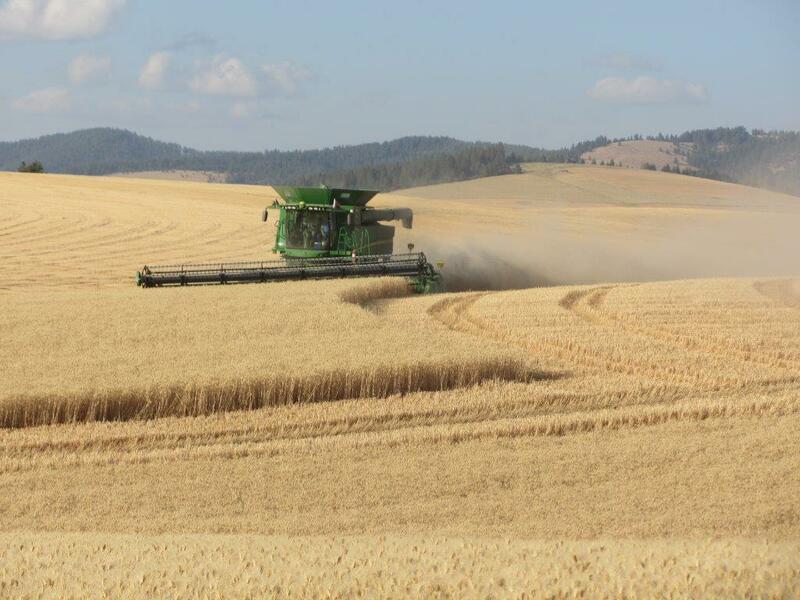 The lack of June rains also reduced our fall wheat yield. Since we have been farming for 40 years, we understand the rhythm of farming. Some years are wonderful, some are not. We have seen fluctuations like this in the past. One year will be a drought and the next will bring too much rain. We’ll just have to wait and see what the next year brings. The end of harvest signals the beginning of a new crop year. We had one employee out working ground to prepare it for fall seeding right after the field was harvested. This forward looking attitude helps us keep the fluctuations of yield and market prices in perspective. If nothing else, most farmers are an optimistic bunch. They are always looking forward to the next crop year, its potential, and how to best use their resources to deliver the best crop possible given the conditions that Mother Nature provides. The conversation around our field dinner last night revolved around plans for fall seeding and, ideas for different crops. 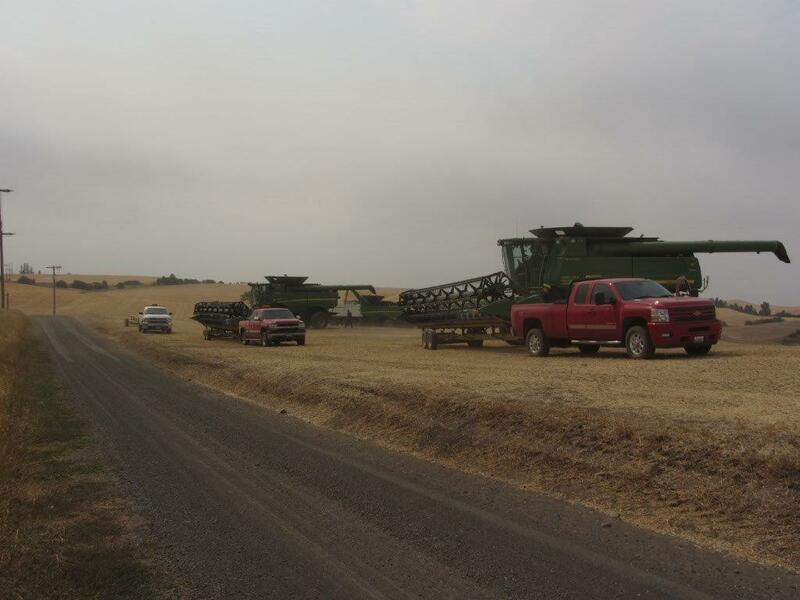 As the combines head back to the shop, the attention has already shifted to the new year. Getting ready to head back to the shop after harvesting the last field of the year.